Power Plants, Energy Storage and Reliable Energy Supply. All about efficient energy production. Turning parts of your factory off. Reliable and self-repairing energy. I don't like the clock solution. This one does just that, without any energy bleed. The inserters for my main steam engine are connected to separate network, powered by single "controller" engine. Controler engine is out of fuel, thus inserters for my main engine are not powered, keeping it idle too. There is a box with fuel (I use wood, because coal has too much energy for this purpose) and two inserters, powered from the main network. First inserter puts a piece of fuel on the belt, second one puts it back in the box. 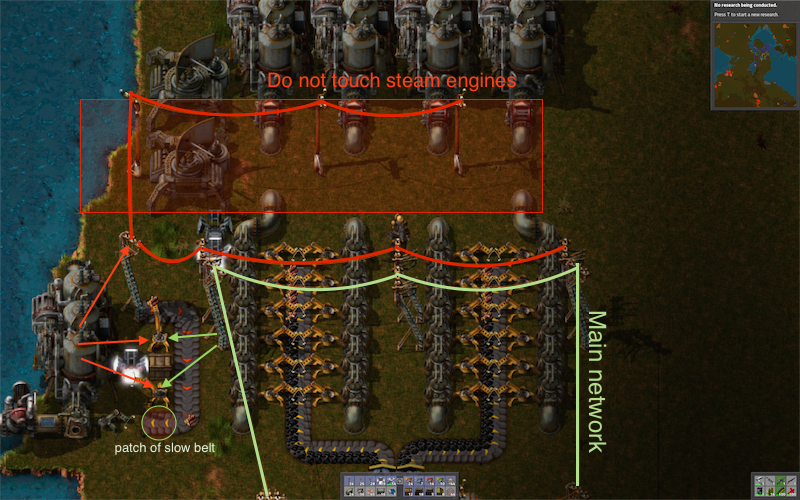 In case of any problems with the main network second inserter starts skipping pieces which are already on the belt. Controller engine springs to life and powers inserters for my main power plant, bringing it to full power in the matter of seconds. I use two radars as a ballast to turn off my main power plant faster. Without any load single piece of wood can keep it powered for days. Update: Check this thread for clean build: My take on using steam as a backup. Works perfectly for me. Last edited by User_Name on Wed Dec 03, 2014 8:09 am, edited 5 times in total. Attach your blueprints to forum posts with Foreman or Blueprint string. So if there's one piece of wood on the belt and the burner inserter decides to take that to refuel itself, your entire base will end up without power? 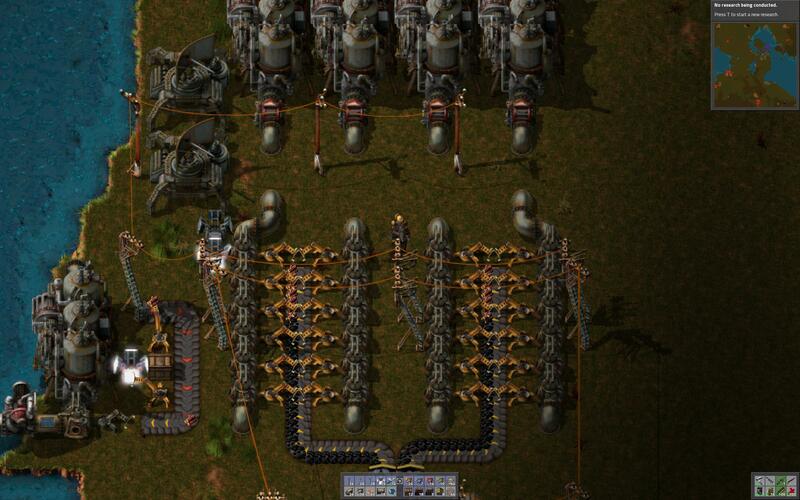 Burner inserter is fueled with coal, and with his average activity won't need refill for the next 100 years. Longer/slower belts should be more reliable, but shorter/faster belts are more responsive/accurate, so I went with the shortest design possible. How long do you have before the inserters use up the power from one piece of wood? What are the connected radars for? Do they help you identify the problem? So far I'm impressed with the results. 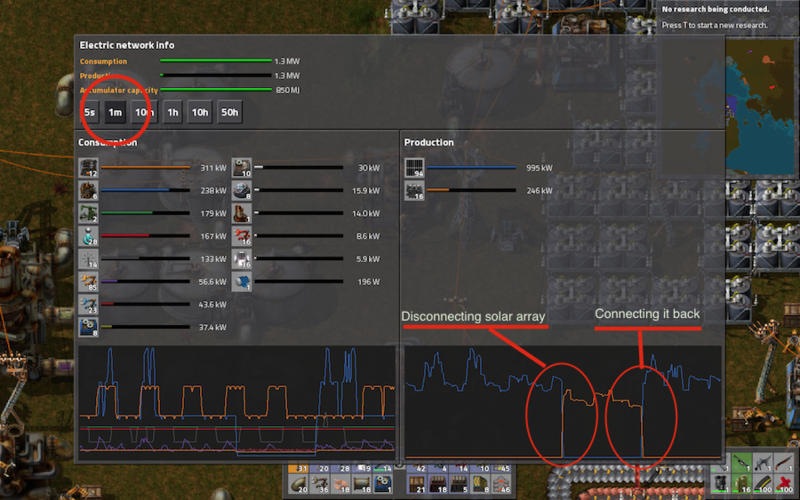 Steam engine kicks in a second or less after disconnecting solar panels/capacitors array, or when inserters show first signs of sluggishness. I've added a pump after the boilers for faster cut-out, but can't really say if it helping. My factory is out of resources at the moment, thus consumption is fraction of what it once was. DerivePi wrote: How long do you have before the inserters use up the power from one piece of wood? What are the connected radars for? Do they help you identify the problem? With 2 radars and a pump inserters go offline in 15-20 seconds. But boilers continue to produce power without fuel and water (pump blocks the pipe) for a whole minute after that due to my current low consumption level. Need to find some coal before I can resume testing. As you can see, steam engine kicked in within a second after a full discharge, and got to the 100% performance in about 5 seconds. There was no blackout, just slowed down inserters. The pits are the steam engine asking "Can I turn off now? How about now? Maybe now?". Steam turned off just after solar panels got enough power to sustain the load. So, setup can be reduced to controller engine, two inserters and a single pump. There is no need to power fuel inserters from the controller network, pump does the job, and it is way more responsive. Remade it from scratch for the new big steam engine. There was no problems with the old setup, you can use it if you are looking for something simple to quickly hack into your existing powerplant to make your factory greener. Just go with the pump variant, it's more responsive compared to fuel control. I don't know the max throughput of the pump, so I used 4. All inserters that you see are on both networks. For the wood catching inserter it ensures that there is ALWAYS wood on the belt, so even if the main network is completely dead (for some weird reason I can't even imagine. Short circuit? ), main steam engine will keep pumping power into it until it reanimates. 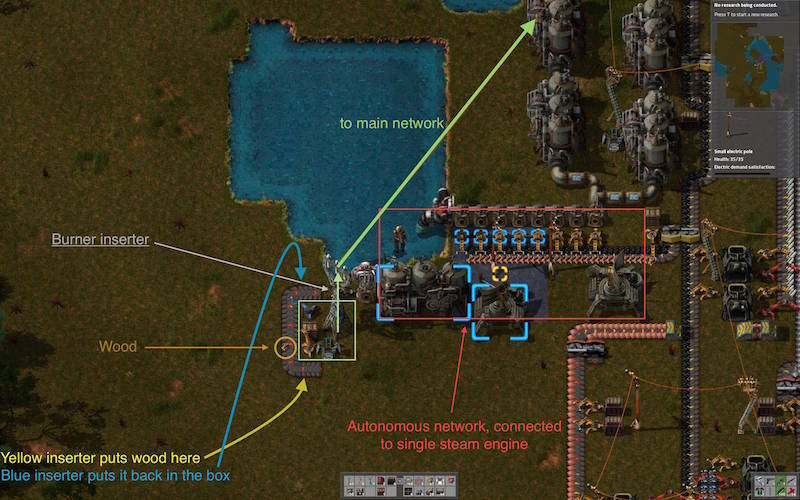 There is no real need to power fuel inserters from both networks, but why not? Spent the whole hour trying to use the network of liquid tanks as storage of ready-made boiling water for the steam engine, like big liquid capacitor. All to no avail. The idea was to use pump to circulate water in circle between two tanks through the few boilers to get it to 100 degrees eventually. It works fine if the tanks are at 50% capacity, for example. But, once they fill to the top, the water stops moving through the pump, and there is no way around it. There no way to automate filling tank only to 50% too. Thus, to get the full tank of hot water I need to use a crapton of boilers to get all the water that passes through the pipe to 100 degrees in one go, and there is no benefit compared to using same crapton of boilers to heat water that goes directly into steam engines. User_Name wrote: I don't know the max throughput of the pump, so I used 4. 30 water/sec, enough to feed 5 engines and 7 boilers. If you're trying for fast response time, you can rotate your first inserter 90 degrees to put it closer to the second. Wood planks also have half the energy of raw wood. DaveMcW wrote: If you're trying for fast response time, you can rotate your first inserter 90 degrees to put it closer to the second. Wood planks also have half the energy of raw wood. Thanks for the tip, fixed inserter and made planks. Update: nope, car cannot be used as a chest for fuel. It go into the fuel tank, not cargo. But replacing all inserters with fast ones improved response time to a fraction of a second. Last edited by User_Name on Thu Nov 13, 2014 4:33 am, edited 2 times in total. Just preload it with a piece of coal, then the planks would go to inventory. Nope, doesn't work. Inserter refuses to put fuel items anywhere except the fuel tank. Anyway, I realized that travel time doesn't affect performance, it's the frequency what matters. Fast inserters is a way to go. Does it really matter anymore? Just realized that I should measure response time in the midnight, not during the day. In daytime pre-heated water already sits in engines, so the picture really shows nothing. You need 14 boilers to heat the water that goes to the tank to 100 degrees. Pump has half the throughput of the pipe. That allows to use pump as flow limiter, so we can use only 7 boilers to fill hot water tanks. Every port of the water tank has the throughput of a regular pipe, but you can use all 4 at the same time. Connecting pumps in series doesn't do any good, but connecting them in parallel works. So, the question is: can we run 40 steam engines with only 2 pipes, single tank and 7 boilers, and still get 20MW? Note the 4 pipes routed from the tank to the pressurization facility. You need 4 on input, 2 on exit. Last edited by User_Name on Mon Nov 17, 2014 9:39 pm, edited 2 times in total. Sorry for my stupid question, but how have you found that out? My calculation ( https://forums.factorio.com/wiki/inde ... gy_storage ) is much less (2.5 MJ). I already thought, that it must be much more. So - again - I just want to ask how you found that out. Placed a hot water tank, small steam engine and 42 capacitors. It charged them to 100% before running dry. Actually, I double-tested that with 20MW engine from the pic above and got different results - 262MJ (53 capacitors). Did not expect that much energy from all the extra pipes. That's ~0.8 MJ per pipe, roughly. That means my calculations above are slightly off, because I did not account for water in the pipes, and I did not remember how many I had used for test setup. Probably none, but I don't remember.